I know it's only March and it's raining and cold, but it's summer, yes? 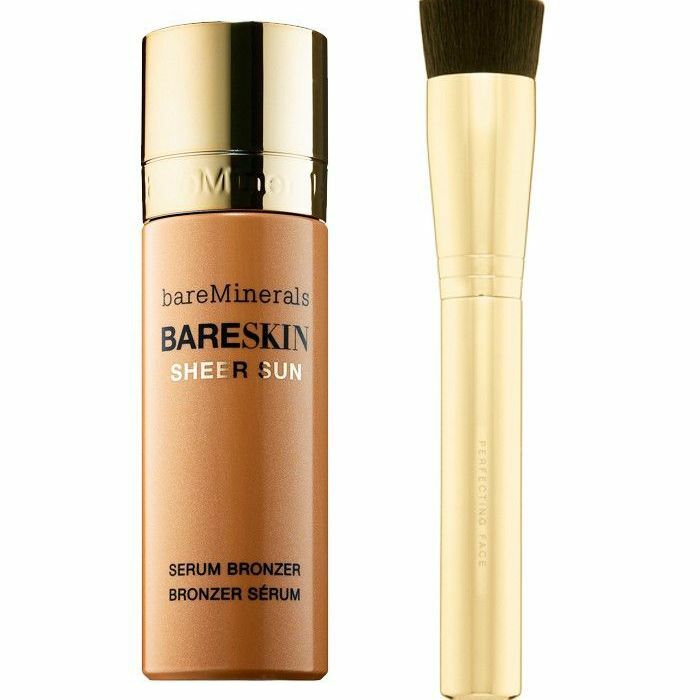 Okay so I'm getting ahead of myself, but in an attempt to at least feel more spring-like, I have been buffing BareMinerals new limited-edition Bareskin Sheer Sun Serum Bronzer (£25) onto the high points of my face where the sun would hit it (were the sun to shine bright enough or long enough). A lightweight liquid, this is the perfect partner to liquid foundation and it doesn't dull the complexion like some matte bronzing powders can. But fear not, this is totally free from any shimmer (it's not party season), which means you can also use this over the whole face if you wanted to fake tan your body but blend your face to match with makeup. I was worried it would be tricky to control, but used with a buffing brush like the limited-edition BareMinerals Perfecting Face Brush With Gold Handle (£24) and a light touch, you have complete control over where the product ends up. It can also be layered up from a sheer wash to a more full-on bronze hue. When I wear this my complexion looks more radiant and I just look healthier thanks to the subtle and, this is the key part, realistic looking tan. On holiday (wistful face), I'll be using this on my bare skin to deepen my complexion as I tend to hide my face from the sun (photo-ageing is real, people). Not only does skin look healthier after I've buffed this in but it also contains antioxidant-rich lilac plant stem cells, which have been linked to a decrease in inflammation and melanin-induced pigmentation. Either way, your skin will just look glowing and happier, which is what we all want right now or anytime really. Have you used a liquid bronzer before? Or do you prefer a powder consistency? Sound off in the comment box below.